Knowing how much matter the universe contains calls for the most precise cosmological cartography. Using maps garnered from DECam imagery and Argonne National Laboratory data processing, astrophysicists are confirming galaxy distribution follows dark matter distribution. An international team of researchers has developed a new map of the distribution of dark matter in the universe using data from the Dark Energy Survey (DES). The DES, underway at the Blanco telescope at the Cerro Tololo Inter-American Observatory (CTIO) in La Serena, Chile, is a cosmological galaxy survey that will map approximately an eighth of the visible sky. The primary aim of the DES is to better characterize dark energy — the source of the observed accelerated expansion of the universe. Click for larger image. By cross-correlating a galaxy distribution map and a mass map derived from weak gravitational lensing, a team of researchers that included Argonne National Laboratory’s Vinu Vikraman showed how the galaxy distribution traces that of the dark matter. Image courtesy Vinu Vikraman / Argonne National Laboratory. Click for larger image. Cover image courtesy National Optical Astronomy Observatory (NOAO) / Association of Universities for Research in Astronomy (AURA) / US National Science Foundation (NSF). One way to do this is by studying the distribution and evolution of another scientific mystery: Dark matter. Scientists estimate that ordinary atomic matter makes up only one-fifth of the total mass in the universe. The remaining mass is 'dark' — because it does not absorb or emit light. As outlined in research published June 24, Vikraman helped construct a 'mass map' to indirectly detect dark matter using weak gravitational lensing shear measurements made by the DES. Gravitational lensing refers to the bending of light by the mass surrounding galaxies, which creates a distortion, or shear, of the galaxy’s shape that scientists can measure to determine the density and matter distribution of the lens. 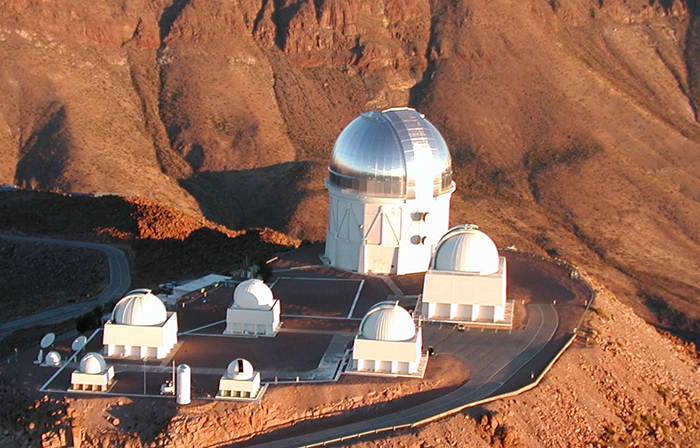 The DES derives its imagery from the Dark Energy Camera (DECam). DECam has five lenses – each about a meter in diameter — and a field of view so large that one image records 20 times the size of the moon as seen from Earth. Every night DECam takes about 400 of these pictures, each about 1 gigabyte in size. These images are then relayed via a microwave link to La Serena, and sent to the US National Center for Supercomputer Applications (NCSA) in Illinois via an optical link. The NCSA reduces and corrects the images, identifies and catalogues stars and galaxies found within, and stores everything in a database. The researchers compared their mass map with a new optical galaxy distribution map, also made from DES data. 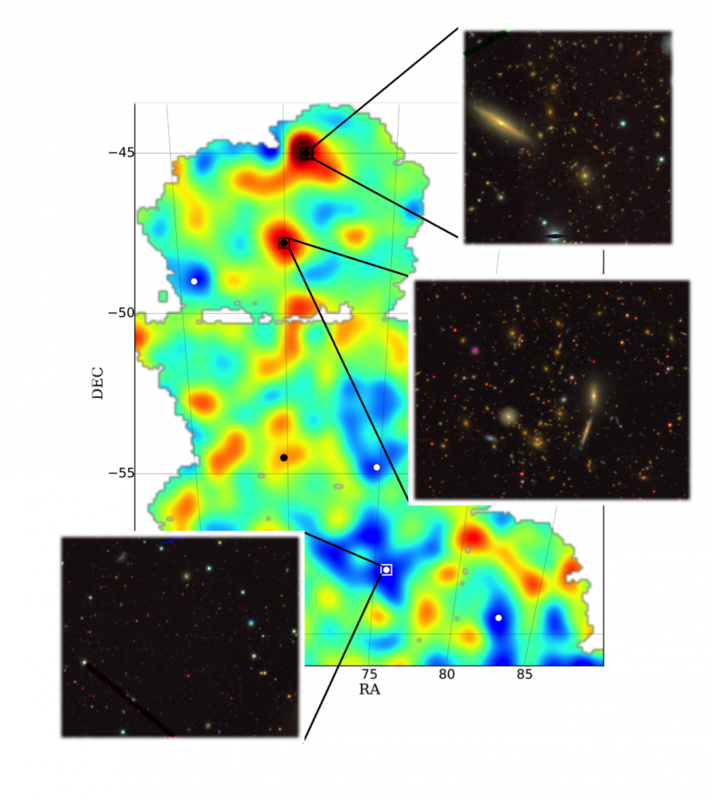 The comparison revealed patterns in the distribution of galaxies and dark matter. As predicted by cosmological simulations that include an accelerated expansion of the universe, galaxy distribution follows the dark matter map. Ultimately, DES data is projected to cover more than 36 times the area of this first map. Scientists are hopeful that this data set will lead to new clues about the nature of dark energy. Read more about the DES mass maps here.